Christus manifestavit gloriam suam in Cana Galileæ ("This beginning of miracles did Jesus in Cana of Galilee; and manifested his glory, and his Disciples believed in him."). Ioan c. 2. / Alex. Varotarius dictus Patavinus pinxit, Patauÿ, in monasterio S. Ioannis de Viridario. / Patavinus pinxit. Mart. Desbois gall. sculp. Copper engraving by Martial Desbois (1630-1700) mid 17th century after Alessandro Varotari detto il Padovanino (1588-1648). The original painting by Varotari is dated 1622 and was made for the monastery of St John de Viridario in Padua. The motif is the wedding in Cana from the gospel of St. John. 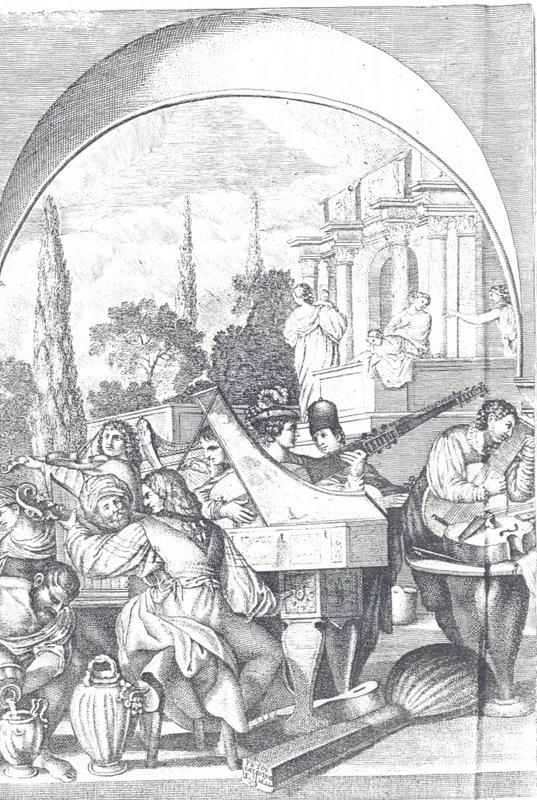 A detail from the engraving showing the musicians playing harpsichord, archlute, lute, violin, harp, violoncello and guitar can be viewed here. This print was bought at Antikvariat Aetheneum, Stockholm in 1992.